The independent science fiction film is a wonderful place to play. Because your funding is smaller, there are fewer expectations from backers that you’ll “follow the trends.” The lower funding also tends to force filmmakers to be more creative in their filming, rely on fewer special effects and focus on the story and the character’s development. And that’s a great place to grow an inventive movie. 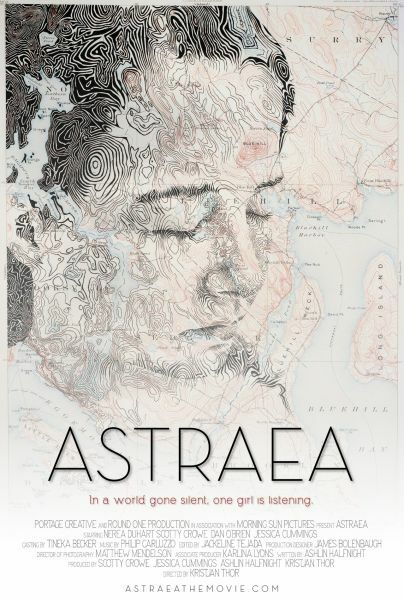 In a market where every post-apocalyptic movie has it’s heart in an alien invasion or zombie uprising, we’re faced in Astraea with an all-too-possible scenario where a disease quickly and efficiently wiped out most of the population. The few survivors are crafty and cautious, knowing that men are far worse danger than any rotting corpse, and that making connections with the few remaining good folks is probably the most precious thing to pursue. Nerea Duhart plays Astraea, a driven young woman. Haunted by visions, she finds herself unexpectedly developing a form of telepathy or clairvoyance. In what is probably one of the best explanations for such a turn, Astraea’s gifts are potentially manifesting now because the population has dwindled, or electricity is rare, or both or something else. She and her brother, played by Scotty Crow, are literally trekking across the country in search of family that Astraea is absolutely sure are still alive. Hard decisions surface when they encounter another couple, cousins played by Jessica Cummings and Dan O’Brien. Of course, there’s a lot of trust and faith to be built, and the eventual decision whether to move forward on Astraea’s quest or stay in the relative comfort of this new family. Can they actually trust Astrea’s visions? And if they stay, are they truly welcome? Beautifully shot, and nicely paced, this is easily the most reserved and realistic post-apocalyptic story since the BBC’s legendary Survivors series. The cast is wonderful and the resolution as complete as you could wish for in such a situation. This entry was posted in Cinequest, Entertainment, Film, Media, Movies, Review and tagged Cinequest, Film, Movies, Review. Bookmark the permalink.